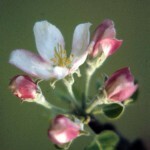 The cultivated apple, Malus domestica Borkh., belongs to the Pomoideae subfamily of the Rosaceae, along with pear (Pyrus spp. ), quince (Cydonia oblonga), loquat (Eriobotrya japonica), and medlar (Mespilus germanica). Cultivars: Top twenty apple varieties grown in the United States, 2010. Data are in thousands of boxes (42 lbs of apples/box). Source: U.S. Apple Association – 2011 US Apple Production and Utilization Analysis (cited 11/26/2012). *Includes only Western production. Eastern and Midwest production is included in other varieties. Note: Sum of varieties may not add to total due to rounding of individual varieties. The center of diversity of the genus Malus is the eastern Turkey, southwestern Russia region of Asia Minor. Apples were probably improved through selection over a period of thousands of years by early farmers. Alexander the Great is credited with finding dwarfed apples in Asia Minor in 300 BC; those he brought back to Greece may well have been the progenitors of dwarfing rootstocks. Apples were brought to North America with colonists in the 1600’s, and the first apple orchard on this continent was said to be near Boston in 1625. From New England origins, apples moved west with pioneers, John Chapman (alias Johnny Appleseed) and missionaries during the 1700’s and 1800’s. 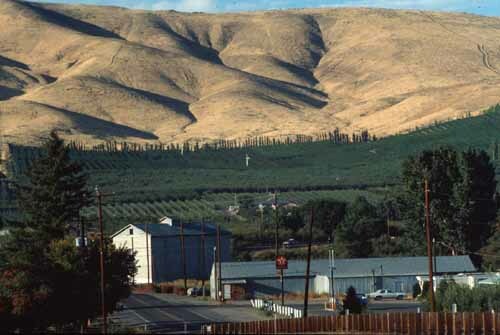 In the 1900s, irrigation projects in Washington state began and allowed the development of the multi-billion dollar fruit industry, of which the apple is the leading species. World production (2010/2011 season) was 61,852,452 metric tons (MT) or over 136 billion pounds. Apples are produced commercially in 98 countries. Additional World data can be obtained from the Food and Agriculture Organization of the United Nations Statistics Division (FAOSTAT). The button below will take you to their website. The United States Department of Agriculture National Agricultural Statistics Service (USDA Ag Stats) forecast the 2011 U.S. apple crop at 9.5 billion pounds. This forecast is based on apple production that is estimated in 29 States. The value of the industry is $1.95 billion. There are approximately 7,500 apple growers in the USA, who on average receive prices of 24.1 ¢/lb. Apple acreage is currently 363,000, and average yield was 611.9 bushels per acre. Leading apple states (in order): WA, NY, MI, PA, CA. Additional US data can be obtained from the USDA Ag Stats website (button below). Small to medium sized tree with spreading canopy, to 30 ft in wild, generally 6-15 ft in cultivation. Tree size and shape is heavily dependent on rootstock and training system (see below). Leaves elliptical with serrate margins, dark green with light pubescence on underside. 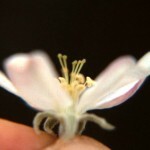 Petals are white when open, but have red-pink undersides when opening, hence the “pink” bloom stage. The ovary is inferior, embedded in the floral cup or hypanthium, containing 5 locules, usually 2 ovules per locule. 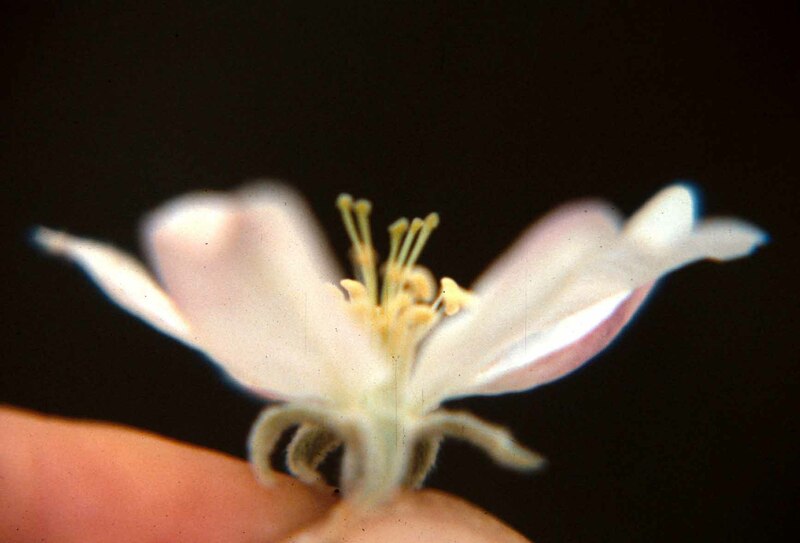 The inflorescence is a cyme of 4-6 flowers, with the center flower opening first; the central flower is often called the “King bloom”, and has the potential to produce a larger fruit than other flowers. Flowers are produced terminally from mixed buds (containing both leaves and flowers) on spurs, or to a lesser extent on long shoots. Spurs form on 2-yr-old and older wood, and generally grow only a fraction of an inch each year. Most cultivars are commercially self-unfruitful. Cross-incompatibility is rare, and most cultivars that bloom at the same time and are not sports of each other will serve as pollinizers, including crabapples. 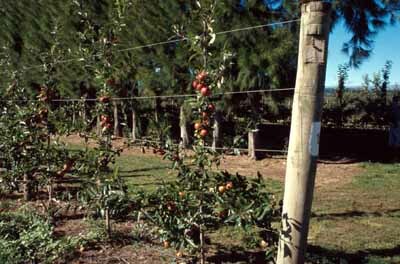 Single apple trees produce some fruit when self-pollinated because most cultivars are not totally self-incompatible. 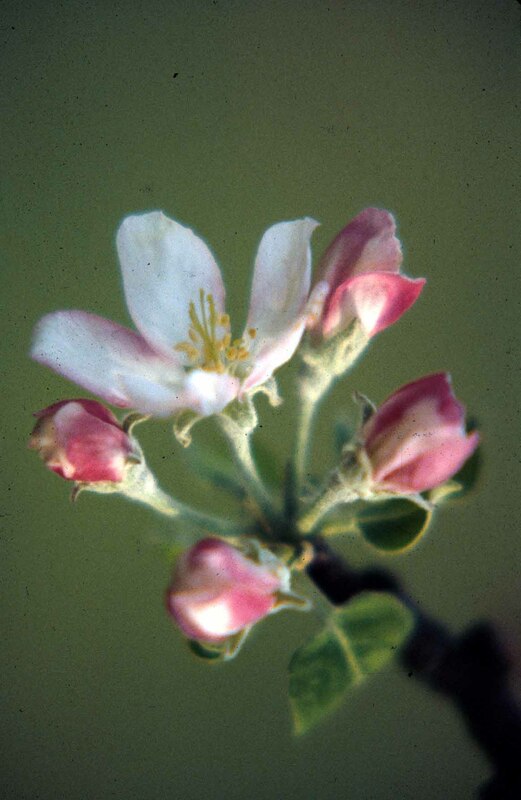 A few cultivars are pollen-sterile (e.g., ‘Jonagold’, ‘Winesap’, and ‘Mutsu’). Honey bees are the most effective pollinator. 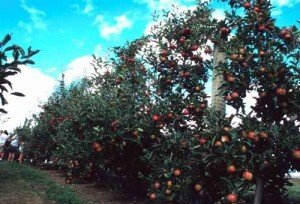 A special fruit type is given to apple and related fruits – the pome. The bulk of the fleshy edible portion derives from the hypanthium or floral cup, not the ovary. Seeds are relatively small and black, and mildly poisonous. Fruiting begins 3-5 years after budding, although a few fruit may be produced in the 2nd year. This varies with rootstock (dwarfing = more precocious) and cultural practices (excessive pruning = delay). 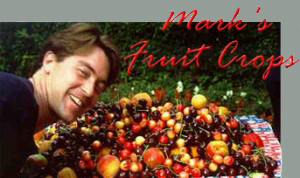 Fruit are usually thinned to 1 per spur, with spurs spaced 4-6 inches apart for attainment of marketable size. Apples are generally thinned with chemicals such as the insecticide Sevin, or the synthetic auxins NAA and NAAm. 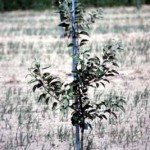 Deep, well-drained, loamy soils with pH 6-7 are best, but apples are grown on a wide variety of soils worldwide.Apples are adaptable to various climates, but can be considered best adapted to the cool temperate zone from about 35-50° latitude. They have a more northern range than many other tree fruits due to relatively late blooming and extreme cold hardiness. Apples reach maturity about 120-150 days after bloom, with some cultivars maturing in as short as 70 days, and others as long as 180 days. 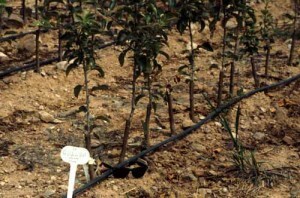 PropagationT- or chip-budded in the nursery, and sold as 1-year-old whips on 1.5 to 2-year-old rootstocks. 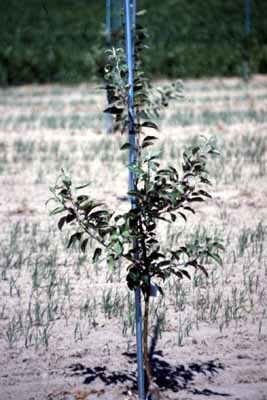 Some popular apple rootstocks and their characteristics. b Increasing susceptibility from 1 to 4. Planting Design: rectangular arrangements or hedgerows; spacings vary by rootstock (see below). Tree densities of over 1000 trees/acre are used in some areas of Europe. Training systems are highly variable; central leader is most common. Pruning: late winter, severity and type of pruning cuts depend on bearing habit, fruit size, inherent tree vigor, and training system. 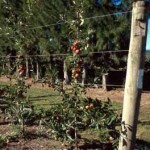 A spindlebush apple tree is just a variation on the theme of central leader (left). A small central leader tree is trained using a metal post for support; the lower tier of scaffolds has formed (center). 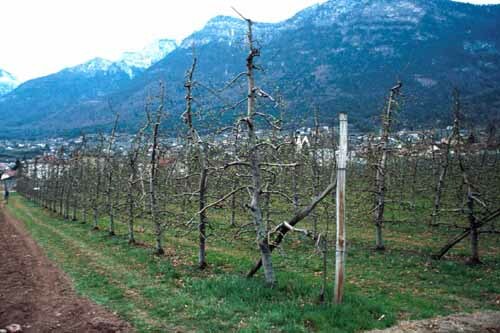 ‘Gala’ apples fruiting in their 2nd year in the field trained to an intensive trellis system (right). Several methods are available for determining optimal harvest time. Days from full bloom is relatively constant from year-to-year, and gives growers a rough estimate of picking date. Cultivars like ‘Gala’ mature early and ‘Fuji’ very late. 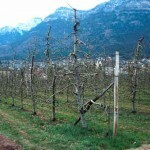 Target values of firmness vary by cultivar and intended storage method, with firmer fruit reserved for long-term storage. 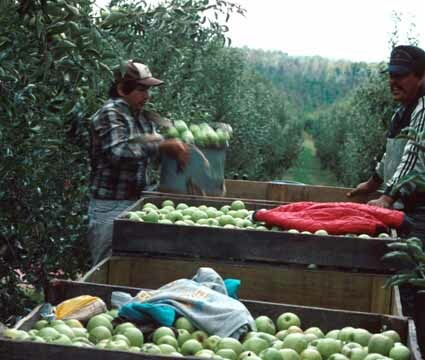 Apples must be picked by hand to avoid bruising and reduction of fresh market quality grade. Fruit must be picked carefully to avoid damaging the spur, where next season’s fruit will be borne. Standard packing line operations are used for apples after harvest – hydrocooling, washing, culling, waxing, sorting, and packing (Figure 12). Apples are packed most often in 4/5 bushel boxes (40 lbs), but polyethylene bags (5-10 lbs) are also popular for retail marketing. Quality grade is based on size and appearance of skin; greater prices are obtained for larger fruit and those with minimal surface blemishes. Controlled atmosphere (CA) storage has allowed the marketing of apples on a year round basis. The storage room atmosphere is altered to retard respiration by reducing oxygen to 2-3%, and raising CO2 to about 1%. Firmer, less ripe fruit are placed in long-term CA (150-365 days), while more mature fruit are sold directly or placed in short-term storage. Other uses include the making of baby food, apple butter or jelly, and vinegar.